Save Our Plaza – Help save our neighborhood! Read our latest success in court! The Southwest corner of 18thStreet and Columbia Road NW has a spirited history in Adams Morgan. It is the site of the Knickerbocker Theater and the tragic roof collapse from a blizzard killing 98 people in 1922. Later rebuilt as the Ambassador Theater, it hosted historical acts such as Jimi Hendrix. Demolished in 1969, the site became home for the first organic Farmers Market in DC. The building and plaza space today was designed by leading DC architect Seymour Auerbach in a modern functionalist style with an amphitheater shaped public space for use by both vendors and community groups. The Plaza is one of the most used public squares in the city and is at the center of the annual Adams Morgan Day festival and many community events over the years. The Present design proposals issued by Suntrust Bank/PN Hoffman & Potomac Partners call for a 7 story condo building subsuming most of the usable current Plaza space. Adams Morgan for Reasonable Development is a DC §11.29 Unincorporated Non-profit Association (UNA) founded in 2010. We are homeowners, renters, and residents living, working, and playing in Adams Morgan who are concerned about the future of our neighborhood. 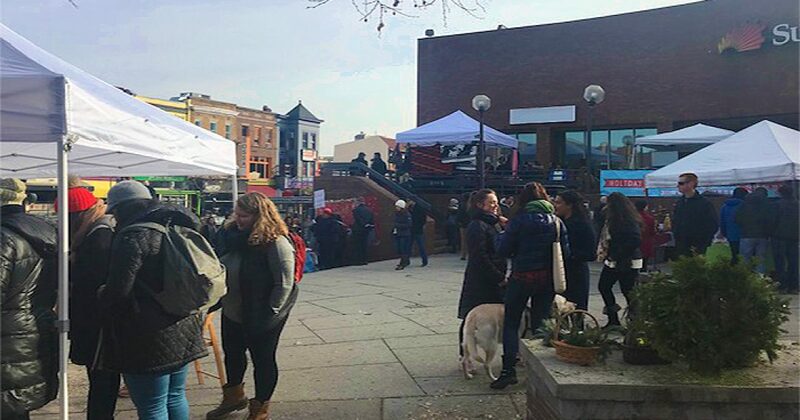 Our managers, which we call Facilitators, are longtime neighborhood residents Vikram Surya Chiruvolu, Chris Otten, and Terry Tyborowski, and we welcome direct contact from anyone concerned about the development of Adams Morgan. Our current effort is to maintain the Plaza space at 18thStreet Columbia Road NW DC for public use, covered in a “good neighbor” agreement between the Adams Morgan Organization (precursor to the current ANC) and the Perpetual Federal bank, the precursor to Crestar/Suntrust bank. (see more history here). Our membership includes over 600 people who have signed a successful 2016 petition to Save Our Plaza in Adams Morgan to our Ward One Council Member. We did lots of research, unearthed critical documentation, and hired lawyer Paul Zukerberg who in turn wrote an opinion that the public has enjoyed an easement on this property for purposes of crossing, gathering, performing and farmers marketing since the bank was built in 1977. In July 2017, along with the neighborhood group Kalorama Citizens Association we filed suit to stop the razing of the Plaza. In August 2017, we won a preliminary injunction from DC Superior Court Judge Todd Edelman, and in Spring 2018 will present the case. (read Edelman opinion here) If you believe that the public has a right to continue to use the Plaza as it has for over 40 years, and if you believe SunTrust Bank has a responsibility to be a good neighbor and property owner in the neighborhood, please join us by joining our member list, following us on social media, and attending one of our regularly scheduled meetings, which we often hold right on the Plaza. VICTORY! Judge stops razing of Plaza! See you in court SunTrust and Hoffman! Hoffman filed for raze permits. It’s go time! How the Adams Morgan Plaza could look if we stay involved.